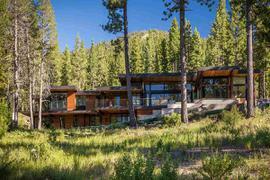 Would you like to hear my opinion about 720 West Lake Boulevard, Tahoe City, CA 96145, the good, the bad, and the ugly for this property? Shoot me an email, and as Paul Harvey said, "and now you know the rest of the story." I pride myself in being honest and frank and doing right by people. No fluff, honest pros and cons from a down-to-earth guy with over 20 years of experience. There is a one story apartment near the street / gated entry with 3 bedrooms and 2 bathrooms. This property has a very long circular driveway with many nice cedar trees scattered among the foliage. There is a 3 car garage with a commode and lots of storage on the south side of the property near the home. There is also an attached 2 car garage with a large laundry room and a bathroom just inside the home. The main living area is where you walk into the home from the front entrance with high ceilings, a large bank of windows and a fireplace. To the left of the living room is a half bathroom, an office, and a master bedroom suite. To the right or south is the kitchen, dining room and a living room. The stairs to the upper level are behind the kitchen. There is a work out room, storage and a master bedroom suite with a sitting area / loft looking out toward the lake and 2 bedroom suites on the north side of the upper level. 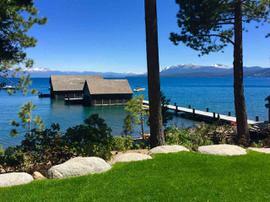 The property at 720 West Lake Boulevard, Tahoe City, CA 96145 is located within in the city of Tahoe City and the FOUR EAST UNNAMED-4EA subdivision. 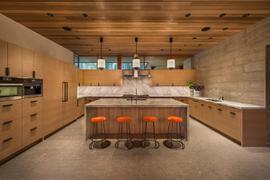 The property was built in 2007 and offers 4 bedrooms 5.5 bathrooms and 5248 square feet. The Single Family at 720 West Lake Boulevard, Tahoe City, CA 96145 is roughly 5.98 miles from Squaw Valley Ski Resort, 8.29 miles from Northstar Ski Resort, 12.75 miles from Truckee, and 2.97 miles from Tahoe City. 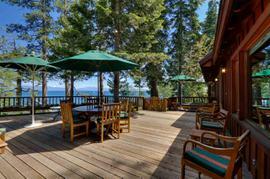 This Elegantly Designed Lakefront Home is a true compliment to Lake Tahoe's magnificent west shore. The property is 2.8 private acres with gorgeous landscaped grounds, w/ tall old growth cedars, starting at the gated entrance to the magnificent 150'+/- shore line. There's a private steel piling pier, two buoys and beach area for summer entertainment. This incredible 5248+/ sq.ft. 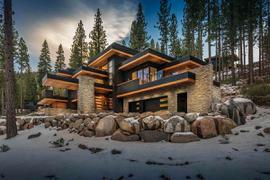 custom home has a grand living room with soaring 20' ceilings and huge picture windows capturing the magnificence of Tahoe.